Join the discussion on our forums! 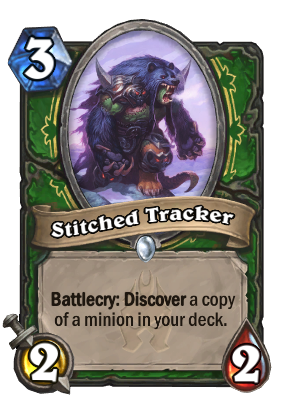 Come discuss Stitched Tracker over in our dedicated Stitched Tracker discussion topic. Battlecry: Discover a copy of a minion in your deck. He's just exercising his right to bear arms. But you have to agree that it's great fun for getting additional copies of minions like Reno Jackson or The Darkness. Play Stitched Tracker to get The Darkness, then on turn 10 or later play Murmuring Elemental and The Darkness twice to shuffle 9 Candles into your opponent's deck, speeding up the process 3x to activate not one but 2 20|20 copies of The Darkness. The card is great in any slower minion based Hunter deck. It was great in Giants, and getting a second Kathrena/N'Zoth/Reno is often game-winning. Pretty good in my Big Hunter deck, just wish it was a 3/3. Would be too strong with discover a copy as-is. If it was discover and remove it from the deck (Tutor effect) -- it would be as a class card, yeah I agree. Thank you my fellow Hunters for playing this card on Turn 3. Thank you for not developing your board or clearing my minions with Eaglehorn Bow. Thank you, for letting me win the game. The only thing that I don't understand is why this card isn't a beast. I doesn't make sense at all and it would be 100% a better card if it was a beast. You got a point there, sir. it feels weak compared to other 3 mana discover minions. Just noticed that the art depicts an orc. Amen brother, staple in yogg and load hunter atm. I stole this card playing as Rogue. Mad fun Shadowstepping and Shadowcasting. So diesel! An insane value-card in a bad class at the moment. As a hunter, you can play slower midrange, but you shouldn't plan for the late game. With DK Rexxar or N'zoth you can be a beast in the late game, but the lack of board clears and card draw, you will fail too often before turn 10. Maybe in the future it will make more sense, because Hunter gets more and more control options. They are ridiculously bad, but that's another story. Terrible value. Basically you are skipping Turn 3 in order to maybe live long enough to play something good. Hunters who pass turn 3 die. Hunters who don't play their big threats like Savannah Highmane on Turn 6, and instead split up their mana, also die. Instead of playing Eaglehorn Bow, Rat Pack, or a good card, you are playing this crappy 2/2.